An echocardiogram is an ultrasound scan of the heart. It is non invasive and provides information about the function of the heart muscle and valves. It is normally performed by an echocardiographer or cardiologist and takes around 30 to 40 minutes. The test is performed in a private room and you will be asked to lie down on a special bed for the test. It can be performed on a hospital bed, for inpatients who cannot come down to the department. Before the scan takes place, the echocardiographer will normally place 3 stickers (electrodes) on your shoulders and chest, to measure your heart rhythm during the study. It is very helpful to time the movement of the different chambers and valves, with the underlying electrical signals from your heart. This provides important information about how synchronised your heart is. 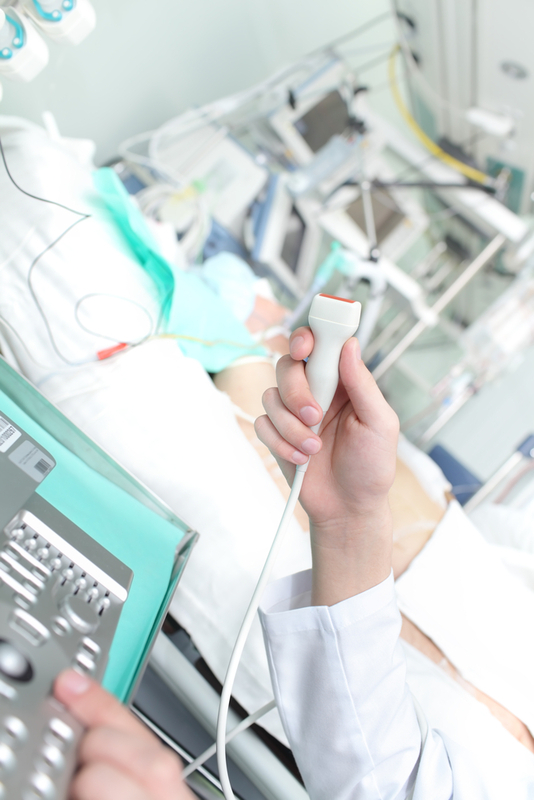 The echocardiographer needs to place the scanning probe on various parts of your chest wall. This allows then to view the heart from different angles and get better views of the chambers and valves. You will often be resting back and may be asked to roll onto your left hand side. This makes the picture quality better. A jelly like substance is applied to the scanning probe, which makes contact with the skin better and once more significantly improves the picture quality. During the scan the lights in the room will normally be dimmed. This makes it much easier for the echocardiographer to see the smaller details on the screen. As you are often facing away from the screen to your left, you may not see all of the pictures during the scan. The views are saved on the machine and if you would like to see some of the pictures afterwards, just ask your echocardiographer or doctor while you are in the room. What should I wear for the test? It is a good idea to avoid wearing expensive or valuable clothes. The jelly that is used for the test is wiped off afterwards but small amounts may remain. This comes off readily in the shower at home and often does not stain clothes, however it is best to avoid wearing your best clothes just in case. What types of things will the doctor be looking for? The echocardiogram can provide valuable information about the overall pumping function of the heart and also regional pumping function of individual chambers. Regional failure of muscle contraction can sometimes indicate decreased blood flow to that area, due to narrowing in the arteries to the heart, or a previous heart attack. The test normally generates very good pictures of the four heart valves and their individual leaflets. This is useful to exclude underlying narrowing (stenosis) or leakiness (regurgitation) of the valves, which may cause dizziness, shortness of breath or chest pain. Additional information can be gained about the blood pressure in the lungs, which may be increased in certain types of lung disease and heart failure. Measurements of the blood vessels can indicate whether someone is overly dry and can help exclude abnormal dilatation of the arteries that can lead to the formation of aneurysms. National Heart, Lung and Blood Institute: What is echocardiography?